Reserve your place with £330.00 non refundable deposit, balance payable as a non refundable instalment 3 months before the course start date. You must be over 18 to book. Limited to 12 places only. ​Puppy training is often looked at as the easy group course to teach, however if you want to set-up a puppy for life then mistakes made at this crucial point can have a lifetime of consequences. There is so much information about puppy training out there - But what is based on fact and what is based on opinion but treated like fact? Should you teach puppy and owners with clickers or without? To have off lead play or not? trainers already teaching puppy classes wanting a refresher course to gather different ideas. This 7-day puppy training instructors’ course has been designed and developed to provide both theoretical and hands-on practical skills in teaching puppies and their owners. During the 7 days you will learn how to help puppies develop socialisation skills and teach their owners how to allow the puppy to develop appropriate skills and create a puppy-human relationship that is based on trust, confidence and empowerment. There is also a focus on teaching puppies behaviours that are useful for daily living and help prepare then to cope with all of life’s challenges. Each student will also benefit from a 20 minute private mentoring session with Chirag. This one to one session is designed to help you go forward with your plans and implement what you have learnt to progress your business and training goals. No matter how good you are as an animal trainer you are likely to make a minimal impact in the puppy-person relationship unless you have skills in helping owners change their behaviours too. So during the workshop we also focus and practice implementing all the training with people. 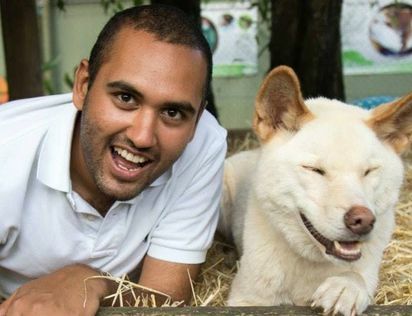 Chirag is an animal training and behaviour consultant based in London. He teaches owners, pets and zoo staff and gives seminars/workshops to professionals internationally. He has studied training and behaviour with some of the leading experts around the world including an internship under Dr Ian Dunbar in California and Jean Donaldson at the San Francisco SPCA Dog Trainers Academy. Chirag has a BSc (Hons) in veterinary Sciences from the Royal Veterinary College in London as well as a post graduate certificate at the University of Lincoln in Clinical Animal Behaviour under Professor Daniel Mills and Helen Zulch (Veterinary behaviourists). He also managed the Training and Behaviour Centre at Dr Roger Mugford’s Company of Animals. "It was excellent and the only way it could have been improved was by having an extra day and perhaps working with his chickens. It has completely made me think about the way I train my dogs in a new way and I would say it's essential for all apprentices to do during the apprenticeship." "The facilitator was very engaging and passionate about his subject. I did not want the presentation to end! Excellent - engaging from start to end." Go to our Local Info page if you need to stay in the area for an event. If you are travelling from overseas and need some help with your travel planning, please contact us. We'll be happy to advise you.